AeroCatch2 Latch Kit UNIVERSAL - Dezod Motorsports Inc - Home of the automotive performance enthusiast since 2002. The popularity and success enjoyed by the AeroCatch (the perfect modern alternative to conventional “hood pins”) resulted in the demand for an equally practical slide-pin attachment system suitable for marine (and other) applications where edge-latching is required.Marine users admired the simplicity and security of the AeroCatch, but asked that a version which eliminated the conventional threaded-pin mount be introduced. To meet this requirement, the shear (sliding) pin was lengthened to extend past the AeroCatch housing into the mounting frame for the panel.AeroCatch2 is now available as a complete kit, constructed entirely from marine-grade materials. Design advantages include positive, fail-safe latching, flush, trip-proof mounting, gloved hand operation, and paintability. 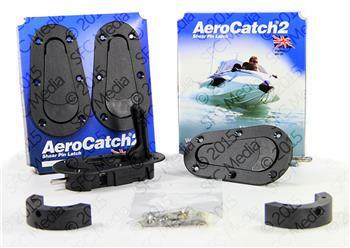 The versatility and durability of the AeroCatch2 has been proven in the demanding world of powerboat racing. Dealer inquiries welcome.